I had never actually seen the video to that SP song - such lovely imagery, I just want to step right in. Thank you! Hope you had a happy Vampire's Day too! Loved your post! I'll be by to comment on it soon. 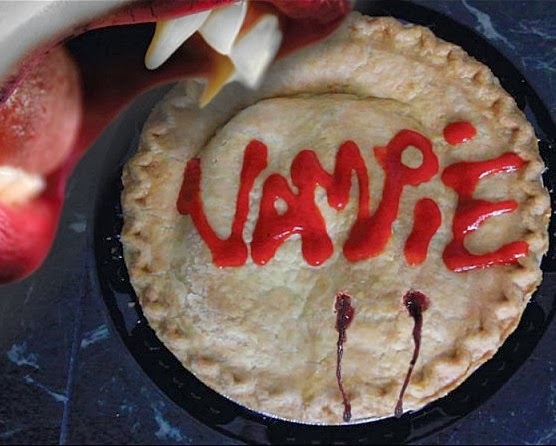 Mmmm, vampie! Looks yummy! My bird likes to eat blackberries and now his little hand-feet are all stained with red like Lady Macbeth, and his bar he sits on is splattered with bloody looking marks. Here is my post! I hope you enjoy it! I love that your bird joined in on the sanguinary celebration! I also loved your story! I'll be by to comment on it soon. That dress is glorious! And I bet they put a bit of blood in the wine... even if just a bit! Sounds like you had a fangtastic Vampire's Day! I'm so glad and I'll be by to comment on your post soon. Thanks to you and the Casa de Cuckoo crew for joining in the fangy fun! Hope you had a happy Vampire's Day too! A wonderful Vampire's Day to you, Holly! I'm very glad to see that you decided to hold this celebration again. And yes, I do like your dress and finding your head again is good news indeed! Thank you! Hope you had a wonderful Vampire's Day too! The Soiree has become a tradition and I look forward to spending many more with you! An amazing Post for the Soiree. So many good things. I'll be downloading that TSPH song today. Also, a thank you for hosting such a wonderful event. I've been out of the blogging loop since Christmas and this was just what I needed to get me back in the water. Cheers! Thank you very much! I'm so glad this got you back into blogging! Your dress reminds me of an art exhibit I saw once. The artist worked in this material that was grown in petri dishes. It was, like, thin layers of tomato skin, stitched together into sails. And it resembled human skin, and had this unpleasant acrid odor. This was paired with the work of a Japanese artist who built enormous apocalyptic machines out of junkyard waste. It was a strange day. Ooh, that does sound similar and strange, but awesome! You were fashionably late. ;) Just like I always am. And I totally agree! We should spread the love every day. Thanks for joining the soiree! Thank YOU for being part of it! I'll be by to comment on your fangtastic posts soon. Cool blood dress, and great post, Holly! Thanks so much, Chris! I dug your post too! I'll be visiting those of you I haven't yet and announcing the giveaway winner tomorrow! This is to inform the general public that Vampires are real.My name is James Franklyn.,am an agent of vampire,am here to introduce our new world trend to you,a world of vampire where life get easier,we have made so many persons vampires and have turned them rich,you will be assured long life and prosperity,you shall be made to be very sensitive to mental alertness,stronger and also very fast,you will not be restricted to walking at night only even at the very middle of broad day light you will be made to walk.In case you are wildly oppressed by some unscrupulous persons we can still help you fight them.Your protection is assured immediately you join.Just contact the bellow email if you are interested we are here to attend to you anytime you want us. Contact the below email for more details.